Attach bags to your inventory to increase item storage capacity. This module is open source, so it's distributed freely. If you find it useful then I ask not for your wealth, but simply to spare your time to consider the world we share by watching Earthlings, a multi-award winning film available to watch online for free. A must-see for anyone who wishes to make the world a better place. Last edited by cornernote on Thu Jan 16, 2014 10:55, edited 1 time in total. I really would like to see this mod on a server I play. It's huge! One thing, making the small/first bag --> you need to use in the middle slot sticks instead of wood. Last edited by cornernote on Sun Sep 16, 2012 13:33, edited 1 time in total. 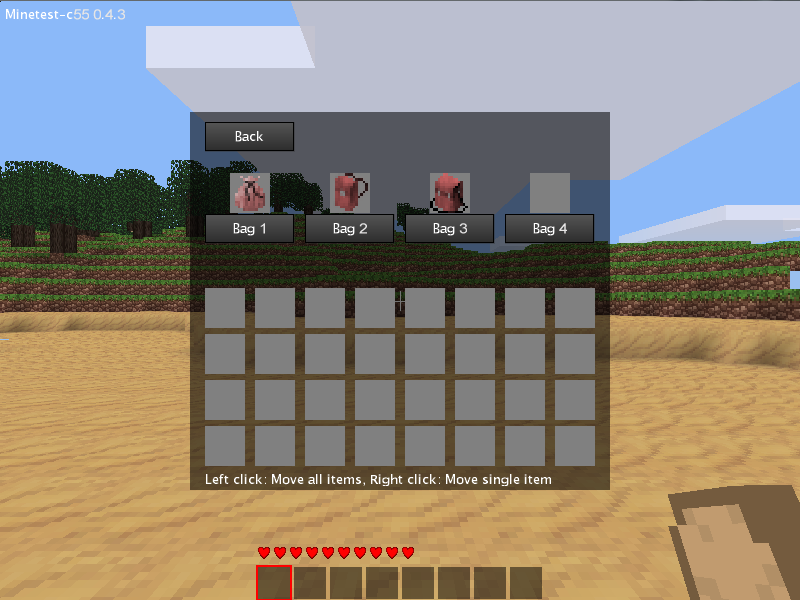 You should make it so when you are on the main bit there is only one button - "bags"
and when you are on the bags bit the button is "back"
Those bag textures look great, thats just what i imagined they should look like. A sack and a backpack. Very nice work. Can I ask what res they are? Do my eyes deceive me or is that actual armor in minetest!?! cornernote wrote: Those bag textures look great, thats just what i imagined they should look like. A sack and a backpack. Very nice work. I do not know much about licenses, GPL can be applied to images? Last edited by tonyka on Mon Sep 17, 2012 02:21, edited 1 time in total. Im not sure. I think GPL is intended for code, but I can't see why it can't be applied to images. Awesome job Cornernote! That armor system you got going there looks great. you really did manage to implement armor system without touching the source code??? Mito551 wrote: you really did manage to implement armor system without touching the source code??? still working on getting it to change actual player values... might not be in 0.4.3 of MT, not sure yet. how do you make the armor show and the crafting thing show at the same time? mikey2020 wrote: how do you make the armor show and the crafting thing show at the same time? That was an older version. I split them into different mods. You can go back through the changelog in bags on git to get the old version. When I move back empty bag to the inventory Minetest crashes. Ragnarok wrote: When I move back empty bag to the inventory Minetest crashes. That happens with me as well. I just edited my post with a fix for that. Win build plain crashes, but linux builds might not. Try it out. I'm sorry, but I'm not getting this error. Are you using an old version of inventory_plus or even minetest itself? I'm using latest git snapshots of minetest and inventory_plus.